carriewriterblog: On Death and Dying - NY Times Reviews "Swimming in a Sea of Death"
On Death and Dying - NY Times Reviews "Swimming in a Sea of Death"
The New York Times reviews "Swimming in a Sea of Death," a memoir by David Rieff about the death of his mother, writer Susan Sontag. 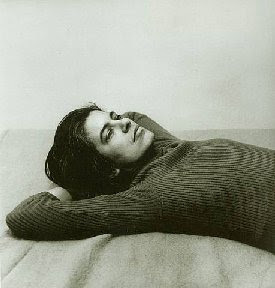 Emphasized throughout is the insistence on the part of Sontag that not only was she not going to die, but that she was immortal, and fought her illnesses with the bravura of "an 18 year-old snowboarder." The review was written by a physician, and apparently the book is a lesson in what not to do, according to the medical profession, when a loved one has no hope. Of course, dealing with real life matters and difficult decisions, especially when it comes to those we love, is a different matter, and textbook appproaches are just those - textbook approaches. It is probably difficult enough to read this book and see what Sontag herself went through, not to mention her family and friends - and her son, but it probably teaches us some life lessons that we don't always handle difficult situations the way the experts tell us, and maybe the goal should not be this, but rather to be ourselves and do whatever we need to do to get through our days. "Such was the strength of Ms. Sontag’s giant personality, however, that apparently no one in her coterie of friends, family or physicians was willing or able to help her along the path to accepting the inevitable. She took them with her instead, on the snowboard heading straight for a cliff," the reviewer, Abigail Zuger. "Mr. Rieff has now guaranteed her a second immortality. He and his mother will undoubtedly survive for a long time to come in medical school courses on death and dying — as a case study in how not to do it." Have you struggled with the death of a loved one, and how did it affect you and your family members? Have you read this book, and what was your reaction?